Have you ever bought a bottle of whisky and then find it a hell cheaper in another place? Be welcome friend. I have been working really hard to create Best Whisky Deals, the whisky price comparator between the most relevant UK whisky retailers. Just search for a bottle and you get the prices shorted from best to worst of the shops that are stocking it. Also as a bonus, you can read tasting notes on more than 600 bottles from several whisky blogs, A Wardrobe of Whisky between them. You can browse whiskies by distilleries, bottlers, regions and styles. But what I find most useful is the fact that you can check bottles by awards. So if you feel uninspired when buying whisky this little page can help you or get inspired with house favorites. 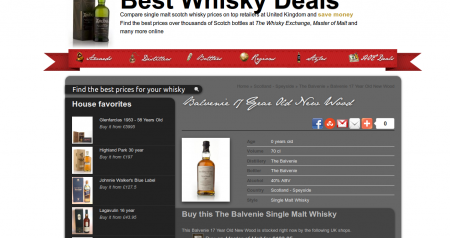 With more than 9000 whisky bottles indexed, if you can’t find it at Best Whisky Deals, you can’t buy it at the UK. By the way, all listed shops do worldwide deliveries so don’t hesitate to order from outside Britain. Next time you order whisky make sure you order through Best Whisky Deals and save money and time.